Universal IVF Medium is for fertilisation of human oocytes and culture of embryos up to the 4-8 cell stage (Day 2 or 3 after insemination). Universal IVF Medium can also be used for embryo transfer. Universal IVF Medium is ready-to-use and especially designed to meet specific requirements during fertilisation and culturing of early embryos. Its superior performance and consistency have been independently documented in several comparative studies. Major IVF clinics throughout the world have used Universal IVF Medium for many years and consider the system to be uniquely robust and dependable. 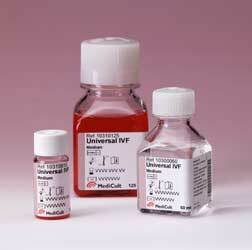 More than 100 references worldwide support the clinical use of Universal IVF Medium.